The Celts have an ancient lore and wisdom tradition reaching deep under the green waters of the land of Manawyddan ap Llyr. The Lord of the Sea is Guardian of the Blessed Isles, a master of humor, wit and wisdom, weaver of illusion and magic. Manawyddan’s country is the Land Under Wave –- he is Protector Lord of the Isle of Man, said to have caused great mists to rise around the Manx Isle so invaders could not find its shores. He rides upon the seas in a golden chariot with a helmet made of flames and a cloak that renders him invisible. His ship, Wave-sweeper, can steer itself by thought alone, moving without wind or oar, and his horse, Enbarr of the Flowing Mane, can travel over water as easily as land. 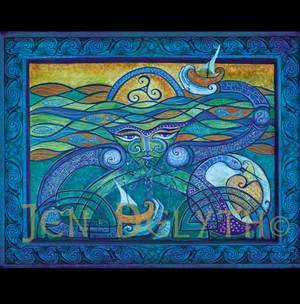 In Ireland he is known as Manannán Mac Lir, and is said to ferry souls on their sea journey to the Otherworld. Manannán governs storms and is predictor of the weather. He is a master magician, possessing the fabulous crane-bag, holder of all his treasures including language. Sometimes he can be seen as a wise solitary Heron, standing watch along the fringed waters of river and shore.